As oral healthcare providers, we talk about the TMJ a lot. It’s a tiny joint with a long name in its unabbreviated form, and it causes an estimated 5-12% of Americans chronic pain. Despite their high prevalence, many of our patients are unfamiliar with temporomandibular joint disorders. If you’ve been experiencing frequent headaches or migraines, have difficulty opening and closing your mouth without pain, hear popping noises when moving your jaw, and tinnitus (ringing of the ears and dizziness), you may have TMD. Luckily, A Smile By Design can help you find relief. What & Where Is My TMJ? 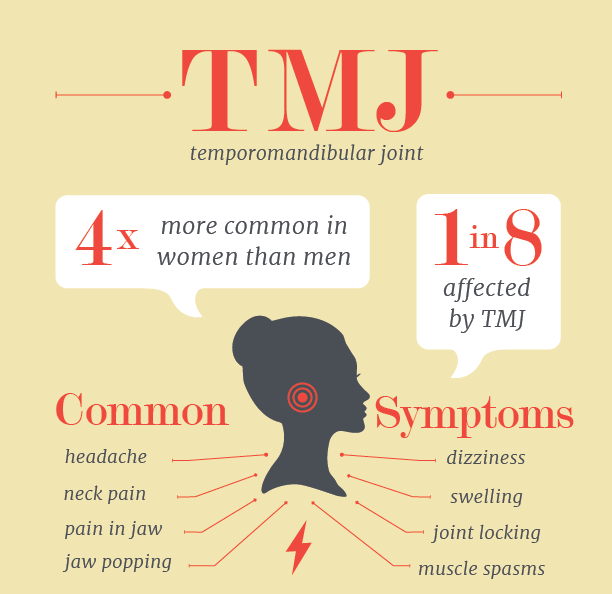 Your TMJ is the hinge that connects your mandible to your temporal bone, or in less technical terms, your lower jaw and skull. It’s much more complex than you might suspect, consisting of muscles, blood vessels, nerves, and bones. It plays a role in your ability to open and close your mouth to chew food and speak—and express exhaustion through yawning. If your TMJ has experienced injury or inflammation, these activities may become painful, and you may suffer a host of other symptoms that make smiling a difficult thing to do. Trauma: this can be classified as either micro or macrotrauma. Microtrauma refers to teeth grinding and jaw clenching (also known as bruxism), and macrotrauma can occur upon impact with your jaw that breaks, dislocates, or otherwise damages the cartilage of your TMJ. You can even experience pain after extensive dental work that required you to hold your mouth open for an extended period. Inflammatory conditions: degenerative disorders like osteoarthritis and rheumatoid arthritis can erode cartilage and bone, and cause deformation of your joints. Stress: unfortunately, this one is hard to avoid—particularly for women in their childbearing years, who make up a reported 90% of TMD patients. Physiological and hormonal differences may contribute to this increased risk, along with women being more prone to arthritis and vitamin deficiencies linked to joint problems. Habits: Frequent gum chewing and nail biting can put a lot of pressure on your TMJ, especially when you think of how both of these habits cause your teeth to meet forcefully and repetitively. Malocclusion: if your bite isn’t in proper alignment, your TMJ works harder when you eat and speak. How Can A Smile By Design Help? If much of what we’ve described is clicking (the way your jaw shouldn’t be!) with you, Dr. Vogler would love to introduce you to relief by addressing the cause, rather than the symptoms, of your TMJ dysfunction. With a thorough evaluation, we can determine whether orthodontic treatment and/or a mouthguard you can wear at night to prevent night-time grinding and clenching can give you TMJ pain the boot. If you’ve got questions about TMJ or anything related to dentistry, your Dansville dentist, Dr. Vogler at A Smile By Design, would love to answer them for you! Call today or request an appointment online!